Weary of war, the Emperor crafted a bold new strategy: peace through trade. One hundred and seventy years ago, he ordered the establishment of Thandar, an independent frontier trading post at the confluence of the four great rivers. Though many argued that peace with the wild tribes was impossible, trade flourished and the trading post quickly grew to a town, then into a small city, and beyond. 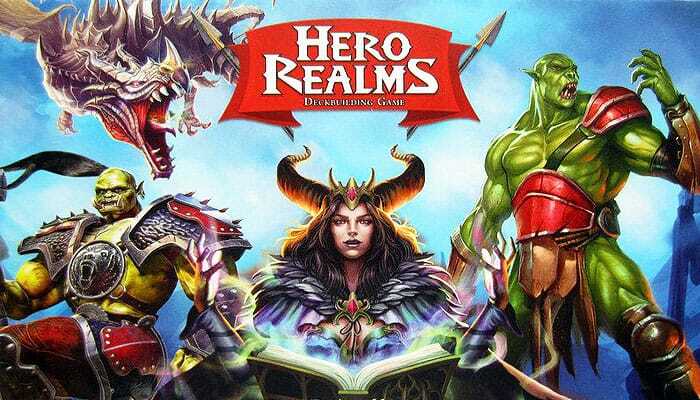 Hero Realms is set in and around the sprawling metropolis that Thandar has grown into. The city-state is now home to folk from all the species and nations of the known world. While Thandar's trade has delivered its promised peace to nations, the wealth generated by its trade spurs endless political and physical conflict amongst its residents. This game comes with this rule sheet and 144 cards. (See the card list on the back). 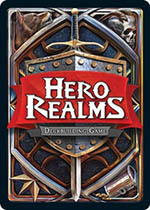 Each player starts with a personal deck of cards representing their resources, equipment, actions, and champions. 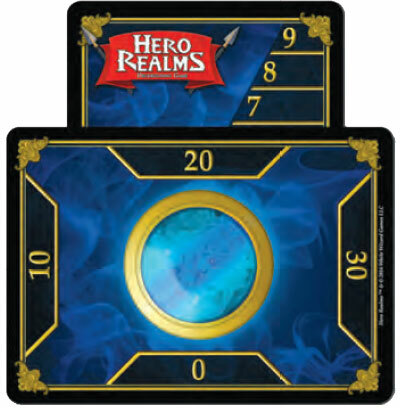 Each turn, you will play all of the cards from your hand to gain Gold, Combat, Health, and other powerful effects. Gold ( ) is used to buy cards from the Market to add to your deck. 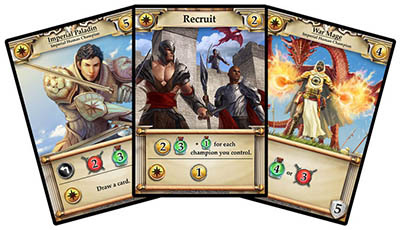 These cards represent the actions you can perform and champions you can recruit to your side. 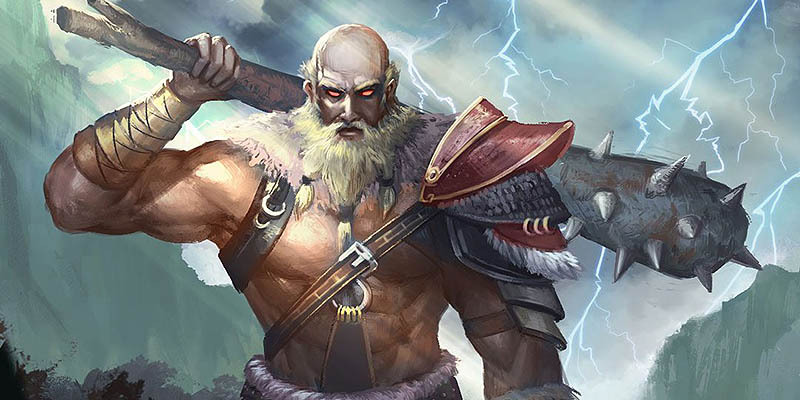 Combat ( ) is used to attack other players and their Champions. Health ( ) is your score. Each player begins the game with 50 Health. When a player has no Health remaining, they are out of the game. The last one standing, wins! 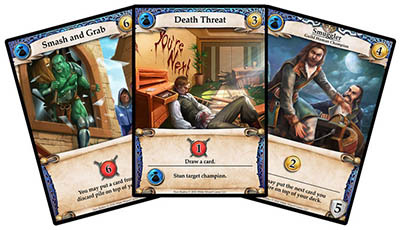 Each player begins the game with a personal deck containing a Shortsword, a Dagger, a Ruby, and seven Gold. To set up the game, shuffle the Market Deck and place it facedown on the table. Then, deal the top five cards of the Market Deck face-up in a row next to the Market Deck. These face-up cards make up the Market. Next to the last card in the Market, place the 16 Fire Gem cards in a single stack, face-up. Finally, leave a space next to the Market Deck for a Sacrifice Pile where some cards will end up during the game. Each player shuffles their personal deck and places it facedown in front of them. Leave room next to these for a discard pile. Randomly determine which player goes first. That player draws three cards (players always draw from their own personal deck). The player going second draws five cards. 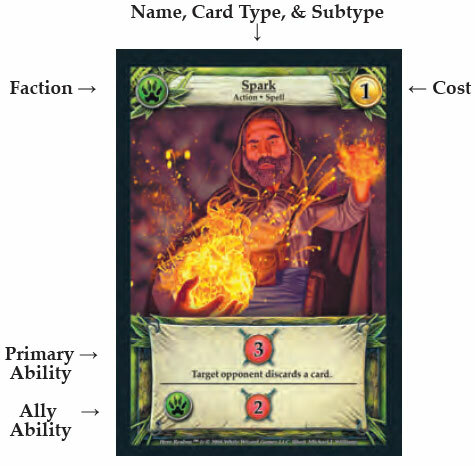 Use the expend, ally, and/or sacrifice abilities of any of your cards in play. Use Gold to acquire new cards from the Market. Use Combat to attack an opponent and/or their champions. There is no cost to play a card; simply place it into play face-up on the table in front of you. There are three types of cards you can have in your deck: Actions, Items, and Champions. When an Action or Item is played, its primary ability happens immediately. If an Action or Item has an ally and/or a sacrifice ability, you may choose to use one or both of these abilities any time during your Main Phase (provided you fulfill the requirements for doing so). Actions and Items are put into play face-up in front of you until the Discard Phase, at which point they are placed in your discard pile. All cards have a title, like Spark, and a card type, like Action, Champion, or Item. Many cards will have a subtype, like Spell. Card names, types, and subtypes do not affect gameplay directly, but some cards look for these words on other cards to grant bonuses. Unlike Actions and Items, Champions are not discarded at the end of the turn. Instead, they remain in play until they are stunned or sacrificed. Champions enter play vertically-oriented, with the title of the card furthest away from you. We call this prepared. Most champions have an expend ability ( ). To use an expend ability, turn the card sideways to gain the effect listed after the @expend.jpg; you may do this at any point during the Main Phase. Each Champion has a Defense number (in a shield) that represents the amount of Damage that it must take in a single turn to stun it. Once stunned, a Champion is placed in its owner's discard pile. Damage to Champions does not carry over between turns. Some Champions are guards. Guards have a black defense shield with word "Guard" above it. Guards that are prepared protect you and your other Champions. While you have a prepared guard in play, you may not be attacked, and your non-guard Champions may not be attacked or targeted by an opponent until all of your guards are stunned. Notes: Guards protect one player and that player's Champions. They do not protect other players or those other player's champions, even when playing a team format. Also, Champions prepare at the end of your turn. (See "Discard Phase" on the back of this sheet). The Primary Ability of an Item or Action is used immediately when they are played. All other abilities may be played at any time during that player's Main Phase. If an ability grants Gold or Combat, that resource goes into a resource pool which can be used at any point during the Main Phase. If an ability grants Health, immediately add it to that player's Health total. Some abilities allow you to choose from multiple effects. Make it clear to everyone which effect you are choosing. Expend abilities are indicated by in the text box. To use this ability, turn the card sideways. You can use the Expend Ability of cards at any point during your Main Phase, including the turn you play the card with an Expend Ability. Example of a champion after using its expend ability. There are some cards which "prepare" other cards during your turn. This would let you use the ability again on the same turn! Ally Abilities are indicated by a faction icon in the text box. On your turn, an Ally Ability may be used as soon as you have another card of that faction in play. The order in which you play your cards does not matter. As soon as you have two or more cards of the same faction in play, you may trigger all relevant Ally Abilities. They may be used at any time during your Main Phase, and each may only be used once per turn. Some cards have a Sacrifice Ability, indicated by in the text box. 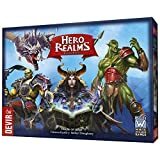 These abilities represent using a magic scroll that works once, or a heroic act of a champion doing whatever they can to save the day. Whenever a card is sacrificed, place it in the Sacrifice Pile. If a card is sacrificed for any reason other than its Sacrifice Ability, that ability does not trigger. (If one of the Fire Gem cards would be put into the Sacrifice Pile for any reason, instead put it face-up in the Fire Gem pile). Some card abilities will give you Gold. When you gain Gold, it goes into a Gold Pool which you may add to and spend from over the course of your Main Phase. Gold is used to acquire cards from the Market or from the Fire Gem pile. 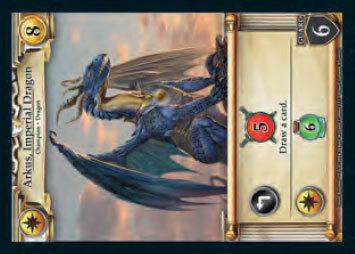 A card's cost is found in its upper-right-hand corner. To acquire a card, subtract Gold from your Gold Pool equal to the card's cost and put the card into your discard pile. 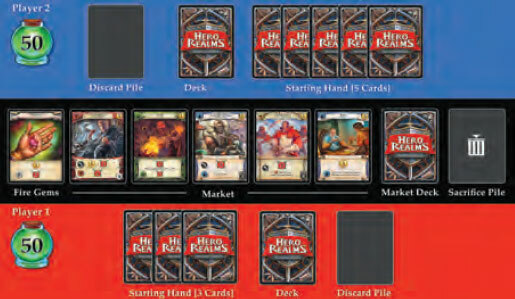 Then, fill the empty space in the Market with the top card of the Market Deck. Acquiring a card does not count as playing it, so it doesn't go into play and you do not use its abilities. Any remaining Gold is saved and can be used to acquire additional cards during the Main Phase. Some card abilities will give you Combat. When you gain Combat, it goes into a Combat Pool which you may add to and use over the course of your Main Phase. You may use Combat to attack your opponent and/or their Champions. You may make any number of attacks during your Main Phase. To attack a Champion, subtract any amount of Combat from your Combat Pool and the Champion takes an equal amount of damage. If the Champion has taken damage this turn equal to or greater than its Defense, stun the Champion and put it into its owner's discard pile. Sometimes a card's ability will instruct you to "Stun target champion". In this case, you stun the Champion without using Combat. (Important reminder: You cannot target non-guard Champions if your opponent has a guard Champion in play!) To attack an opponent, subtract any amount of Combat from your Combat Pool and lower your opponent's Health by that amount. Opponents cannot be attacked if they have a guard Champion in play -- you'll need to stun guards first before you can attack the player they are protecting. Note: Many Champions have an Expend Ability that gives Combat. Combat gained from expending a Champion goes into your Combat Pool; your Champion does not attack another Champion directly. Lose any Gold remaining in your Gold Pool. Lose any Combat remaining in your Combat Pool. Put all in-play Items and Actions into your discard pile. Put any cards left in your hand into your discard pile. Prepare all of your Champions. During your Draw Phase, you draw five cards and then your turn ends. Note: If at any time during your turn your personal deck is empty and you need to draw or reveal cards from your Personal Deck, shuffle your discard pile and place it face-down as your new personal deck. Example: At the beginning of your Draw Phase you have three cards left in your deck. Draw them, shuffle your discard pile into a new personal deck, then draw two more cards.